Long, lush lashes? I used to think that my tube of Diorshow Mascara was enough to keep me happy. (And, for all intensive purposes, it still does get the job done.) But after my experience this weekend at the Shu Uemura Lash Bar, I have definitely seen the light when it comes to fake lashes. I'd been on the fence for quite awhile with the whole faux movement. Were fake lashes really necessary when my own were already pretty long and thick? But after a trip to the Newbury Street location of Shu with two of my fave gals, Katie and Emily (we were in Boston for a girls' weekend), all that changed. Suddenly, I found myself inexplicably drawn to the wall of false lashes, incredulous at all the choices and curious as to how I might look with a set. Feathers or fringe? Sparkles or crystals? There were seriously so many choices, I was at a complete loss for words. Luckily, Tavi -- an absolutely fabulous sales associate on a first name basis with every client who walked in the store -- was there to help. 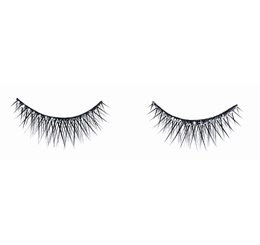 He suggested the Dazzling Black Diamante False Eyelashes ($25), which have rhinestones along the lash line for a gorgeous touch of sparkle. This is where the process got fun. After picking out the lashes, Tavi sat me down in a chair and proceeded to line both my waterline and lid with a black liquid liner, which really made my eyes pop even before applying the lashes! Then he coated my real lashes with black mascara -- an excellent way to get the faux lashes to stick and look more authentic. After rubbing the fakes between his fingers briskly and coating the strips with glue, he placed them precisely along my lids and made sure they were stuck good and tight before relining my eyes with more liquid liner. The end result? An absolutely amazing transformation! My lashes went from pretty good to large and in charge in only ten minutes. Don't believe me? Check out how they looked! How it works is this. You pick the lashes, the associate applies them for you, and then charges you for the lashes and application. They even throw in a free bottle of lash glue for reapplication on later dates. (This is great, since the lashes are reusable!) Prices vary depending on the cost of the lashes, but are usually between $40-$50. (The total for my lashes and application was $54.) You can check out the entire line of lashes available on Shu Uemura's website. If you have a special night coming up, this is definitely an option worth looking into. It's offered at every Shu store and counter -- all you have to do is ask! I'm totally addicted to fake eyelashes! You look HOT with them on!! fabulous lashes!! what an experience! wow $54 for some faux lashes!! Thanks so much, ladies! $54 was a definite indulgence -- but I could never have pulled this off applying them myself! Uber sassy, Miss! I love the lashes on this BeautyChick! Wow! What a great offer it is! I also Like the Eyelash Extension. The eyes look so amazing by applying the Lashes.